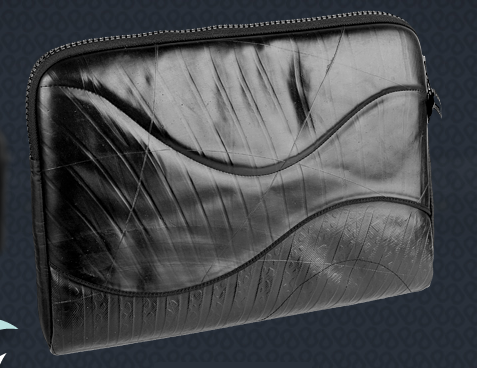 This one is from Alchemy Goods and made from recycled inner tubes and recycled seatbelts – 67% recycled materials. Perfect for my little ibook. This one from Freitag is made from recycled bicycle inner tubes, seat belts and truck tarpaulins. One of kind you can pick off their website. Both of these companies offer a wide range of sizes and prices. Beautiful design – laptop sleeve created from recycled tires. They also make laptop bags and ipod cases. 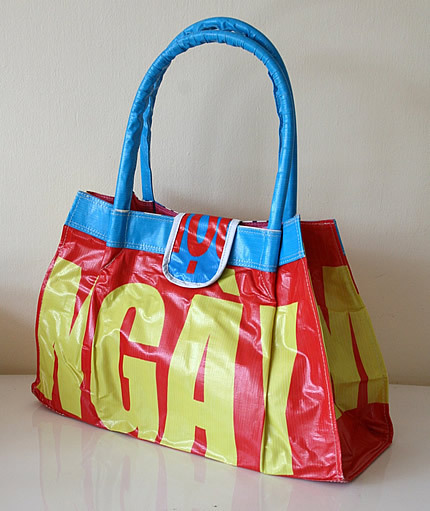 These aren’t the first bags I’ve seen made out of recycled vinyl billboards, but I like these the best! This etsy seller has created these bags in a couple of nice shapes with inner pockets and linings. I love the bold lettering and international flair. Why look like every other eco-friendly tree hugger on the beach? 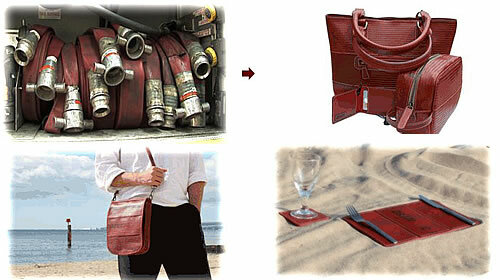 Created from de-commissioned fire brigade hoses, lovely designs for your home, as well as bags, wallets and belts. The handbags are lined with fabric reclaimed from old office furniture, When you’re wearing one of these bags or belts, you’ll be smokin! …but no fires, please!! 50% of profits from this range is donated to the Fire Fighters Charity. I’ve always liked the bags from RedCampers with their signature ‘vacation slides’ as decoration. But these new laptop bags seem to bring quality and functionality to a whole new level. First they are made from original vintage car upholstery …so you know this bag will last forever. 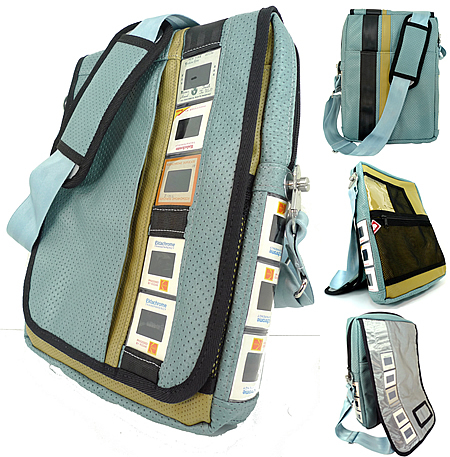 In addition, the bag is made up from original airplane seatbelt clips and seatbelt webbing along with original vintage slides of someone’s vacation. Do you have extra vintage slides hanging around your house? 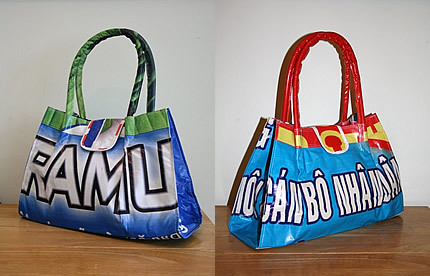 You can send them to RedCamper and they will make your bag out of them!